Views - Is There Still Upside To Naspers? Is There Still Upside To Naspers? The big giant on the JSE has been trading mostly sideways since the beginning of the year. It has traded predominantly between R2,800 and R3,800 unable of breaking one way or the other, mostly tracking Tencent’s performance. Below we take a closer look at this correlation and what we believe might happen to Naspers leading up to their annual results close to the end of the year. I’m pretty sure that everybody who follows the Naspers share price first has a look at what Tencent’s share price did that morning in Hong Kong, long before the JSE opens. This normally provides you with a good estimate of what you can expect from Naspers for that day. 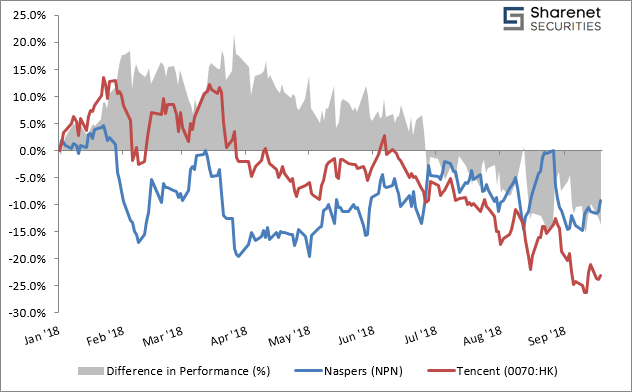 One of the biggest headaches for Naspers’ directors have been the discount of Naspers to its underlying assets, especially when looking at the value of their Tencent holding. Their plan to narrow the discount is to free up funds to finance future growth projects and accelerate the growth in their classifieds, online food delivery and fintech business globally. In order to achieve this, they have sold their entire Flipkart stake, their stake in TBO Group (online travel distribution business) and reduced their holding in Tencent as mentioned above. They have used these funds for numerous investments this year, including Swiggy (Indian online food ordering and delivery platform), Movile (global leader in mobile marketplaces), PaySense (Indian credit provider), Zooz (Israeli payment technology platform), letgo (American app for second-hand buying and selling), Webuycars (local car-buying service) and closed the Delivery Hero acquisition from Rocket Internet SE to become Delivery Hero’s largest shareholder - all of this in 2018. Last week they also announced they are listing their Video Entertainment business separately on the JSE as the Multichoice group. All of this sounds promising, although it will take time for value to reflect. What is very encouraging is how proactive they have been. Focusing more on the short-term, Naspers’ annual results are due at the end of November and we expect the share price to climb steadily as we get closer to the date, of course with its usual volatility.